Andy's is proud to offer the highest quality materials, but the aim for excellence doesn't stop there. Our friendly, helpful sales staff will assist you in finding the right style and material for your fencing project, and our trained and skilled craftsmen will build your fence with pride. 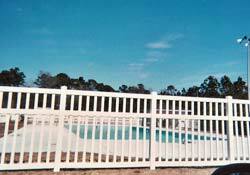 We do all types of commercial fencing for contractors in Jacksonville, NC and all over the U.S. Contact us for more information on our commercial fencing services. What's more, we offer our customers 100% financing. We also accept checks, Visa, and Master Card. Here at Andy's Fence we do not take your money up front, like some of our competitors. We will send you an invoice after the work is completed and you have 10 days to pay in full. That gives you 10 days to inspect our work and make sure your fence is right. Over the past 16 years, we have always put our 10,000 plus customers first. Contact us today by email or call 910-329-1909 for more information.